Is India prepared for REITs? Real estate is one of the few sectors that has witnessed a steady and fast-paced growth over the years. The most luring advantage of investing in real estate is that it is unaffected by the instability of the market and also shields its investors from financial risks. This is the reason why investing in real estate is a better option compared to the other forms of investment. With the government introducing a plethora of reforms in the real estate sector including the RERA and GST reforms, there will be an influx of real estate investments. The origin of a new concept like REITs with these reforms in place gives more scope for better security and will organise the real estate sector better. REIT (Real Estate Investment Trust) is a concept that has been proven successful in other countries and is expected to leave a mark in the Indian property market as well. REITs only own or invest in a property that is profitable. They can be residential or commercial and across all sectors. These trusts are similar to mutual funds. In REITs, the investors can put their money in various other real estate properties just as how investors chose from a number of stocks to invest in mutual funds. The REIT’s members don’t invest in the physical property. The assets held by the trust are either rented or leased out. The money that is generated from the property as rent or lease amount is then distributed among the investors as their dividend share. Again, similar to mutual funds, each investor has to purchase stocks or shares in the trust. The dividend they get from their investment will be directly proportional to the percentage of shares they hold. Diverse portfolio – REITs make investing in real estate more secure than it already is considered to be. Investors are not restricted to one locality or one type of property. This way, if one variant doesn’t seem lucrative, their losses get compensated with the income they get from the other segments that perform better. Stable income from dividends – Usually, REITs split 90% of the income received as rent among the shareholders. At times, even the entire rent amount is distributed. Unlike in the case of stocks, the rent received from a property generally remains stable thus making the dividends a reliable source of income. Liquidity of assets – The property market is not as liquid as the stock market and thus there is always a second thought when it comes to making an investment. However, REITs not only attract more investments but also make real estate as liquid as the other forms of investments. With investors buying stocks and not the actual properties, instant liquidation is possible. Steady performance – In general, real estate is always considered to be a very stable investment option and REITs up the stability factor by a notch. An influx of investments – Instead of individuals, when REITs buy more properties, developers have a better chance to sell more units. This will thus encourage developers to expand further. Protection from instability – When the economic scenario witnesses rough times, the real estate sector gets impacted thus reducing the number of investments. REITs, on the other hand, give great insulation from market risks thus attracting more investments regardless of the economy. More foreign investments – One of the main targets for developers have been the NRI investors. 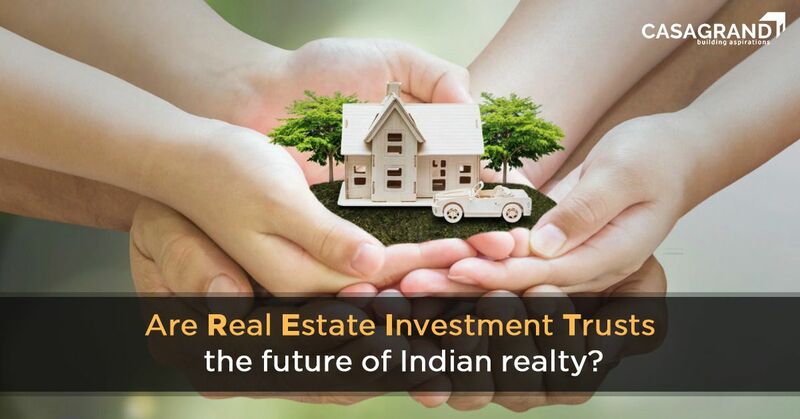 But a major concern for NRIs investing in India is that they cannot visit the property they invest in thus reducing the chance of investing in real estate. But with the formation of REITs, they will be only buy stocks, encouraging investment in the real estate sector. REITs have made a grand entrance into the Indian market at the right moment – the introduction of the RERA reforms make the real estate sector more transparent. The list of criteria that the SEBI released for trusts to follow to be listed as recognised REITs, along with the aforementioned RERA reforms, provide great scope for REITs to make an impression in the Indian real estate sector. Apart from the fast development and stability, this is another reason to make an investment in real estate. Casagrand provides homes that are situated in convenient locations with world class amenities. Invest in Casagrand and unlock your dream home.